Uploading your own Image/Logo/Banner to your blogger header is one of the most important things you need to do, as a blogger. If you look very well, you will see my blog Image/Logo header. That is the good handwork of my good friend, Oracreatives. In this post, you will see step-by-step guide with pictures to show you how easily upload your own Image/Logo/banner into your Blogger blog and make sure that it’s positioned well and looks just as you want it without the Blogger lines around your new Image/Logo/banner. 1. First, create the image/logo header that you like and suit your test. Save it in your PC under your Documents. You can create one using Corel draw. 2. After creating a header which you want to insert as your blog image/logo/banner header, login to your blog "Dashboard" and clicked on "Layout". 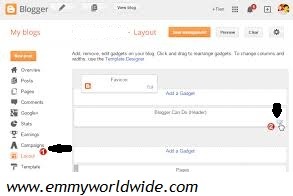 Your blog "Page Elements" should be automatically open. 3. Now click on the "edit" option on the “Header” portion. A new screen will open up. (i) Upload your new header from your computer. (ii) Choose "Instead of title and description". 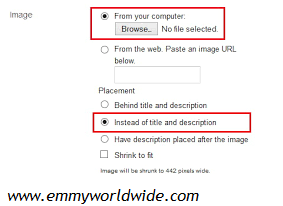 (iii) Choose "Shrink to fit" (this resizes your header so it will fit your blog if your header ends up being too big). 4. Click "Save" to effectively apply the Image/Logo/Banner as your blog’s new header. View your blog homepage and see the image/logo/banner you uploaded, at the top section of your blog. After uploading the image/logo/banner you need to centralize it to fit your blog properly. Read how to centralize your blog image/logo/banner header. Related Posts: Blogger tips, Blogging tips. Labels: Blogger tips, Blogging tips.